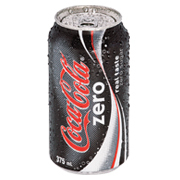 I thought I'd never say that, but it's true - Coca-Cola have followed Pepsi's lead with their latest release in the UK - Coke Zero. The idea is it's meant to taste just like normal Coke, just without all the sugar and calories. Pepsi did this years ago when they released Pepsi Max. Both of these drinks are aimed at men too macho to drink diet Coke, which has always been marketed at women (see what I mean). I spotted this in Sainsburys the other day and bought a small bottle. It doesn't taste quite the same as normal Coke, however it is very close and tastes a lot better than diet Coke (I'm not too macho to drink diet - I'm a techie afterall). Taste-wise, it's probably somewhere between Coke Lite (as sold in mainland Europe) and normal Coke with a slight lemony taste. I'm hooked - I was a big fan of Coke in high school and now I'm a bit less active and a bit more conscientous about my weight, I've finally found a worthy substitute.